Family Fit: Find Your Balance is a weight loss program designed to bring family members of all ages together to create a healthy lifestyle. John Mayer, a clinical psychologist who specializes in cases involving youth as well as in sports psychology, is the creator of the program. This book explains how to incorporate fitness and healthy eating into a busy, modern family schedule through fun and interactive activities. This will not only help with improving health, fitness and weight loss for all members of the family but will also promote harmony and better communication. The dietary component of this program involves learning how to introduce healthy food to the family that does not appear to be typical diet food. One of the ways this can be achieved is by adjusting favorite family recipes to healthier versions that are higher in nutrients. Mayer encourages a dietary intake of 40% protein, 40% carbohydrates and no more than 20% fat because he says the medical evidence shows that these proportions help the body function more efficiently. One of the most important elements to success with getting the family to eat healthy is to ensure that all undesirable foods are removed from the home. Mayer also suggests planning ahead to make sure that healthy choices are always available such as for family outings and school excursions. Meals that are fast and easy to prepare are emphasized and the creative use of leftovers are encouraged to make it easy to incorporate healthy eating into a busy family schedule. Family Fit also recommends preparing large portions of healthy side dishes such as salad, steamed vegetables and soups while limiting portion sizes of the main dish. Breakfast is highlighted because of its importance in fueling the body for the day, reducing cravings and boosting motivation. Carbohydrate foods such as breads, cereals, pancakes and fruit are recommended for weekday meals while omelets are suggested for the weekends. Ideas for quick and healthy lunches and dinners are also included in the Family Fit Diet. In particular parents are advised to make school lunches fun and attractive and to involve all members of the family in meal preparations. He also offers advice on how to deal with eating protests from children and teenagers when implementing dietary changes. Cereal, whole wheat bread, tortillas, pasta, pancakes, eggs, lean meat, salads, steamed vegetables, fruit, yogurt, low fat cheese, light mayonnaise, low fat salad dressing, Healthy Choice frozen entrees, veggie burgers, peanut butter. Exercise is a major component of the Family Fit plan however Mayer highlights the importance of finding physical activities that are fun so that everyone can enjoy them. Suggestions to get the whole family engaged in exercise include family bike rides, tennis, outdoor sports, walking the dog and gardening. Family Fit: Find Your Balance retails at $16.95. Can assist with weight loss for the entire family. Addresses the emotional and psychological elements necessary for making healthy lifestyle changes. Will bring the family together and promote better communication. Gives suggestions for activities and foods that all members of the family will enjoy. Emphasizes the importance of drinking water. May be difficult for the entire family to adjust to the eating plan. Does not include a detailed meal plan or recipes. Some members of the family may require a more structured or targeted approach to exercise and nutrition to address specific health concerns. 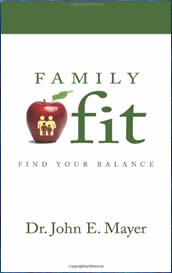 The Family Fit Diet is a program that will involve the entire family in healthy eating, food preparation and exercise. This will not only assist with promoting weight loss and better health but will also enhance emotional balance and interpersonal communication within the family. Family Fit will appeal to families who are ready to embark on a lifestyle change and learn positive habits that can be implemented as a long-term approach to a healthy life.